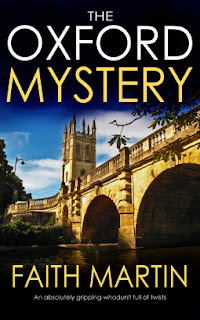 Today is my day for the Blog Tour for the Oxford Mystery by Faith Martin. Then womanisingtaxidermy society president, Maurice Raines, is found with a knife in his neck in the dining hall. However there are many suspects, including Maurice’s wife and his lover. The college and police need Jenny’s help to solve this perplexing case. But can Jenny keep her concentration with a budding romance on the cards? This is the fifth in a series of enjoyable murder mysteries with a great cast of characters and baffling crimes which will keep you in suspense to the final page. Perfect for fans of classic whodunits by authors like Agatha Christie, LJ Ross, TE Kinsey, and J.R. Ellis. More JENNY STARLING mysteries coming soon. Join the Joffe Books mailing list to be the first to hear about the next in the series. Jenny Starling has a three month assignment in her job as a traveling cook. She is delighted. She has a prestigious job at a prestigious university and she will be soon serving several taxidermists who are there at a convention. While Jenny is thinking up a choice menu, an unnamed person is plotting murder. When taxidermy president Maurice Raines is found murdered, Jenny quickly slips into her effective role as an amateur sleuth. With all of the conventioneers having strong alibis, both Jenny and the police definitely have their work cut out for them. As it is, Jenny is dividing her time between cooking and sleuthing, but this time she also has a romantic interest. In this series to-date, Jenny’s focus has never been directed towards romance. It was a delight to see something blooming in that direction. I am not sure what is next for this series, but I certainly look forward to seeing more of Jenny in the future. Many thanks to Joffe Books, Books n All Promotions and to NetGalley for this ARC to review in exchange for my honest opinion. Formerly published as Deadly Stuff under Faith Martin’s pen name Joyce Cato. 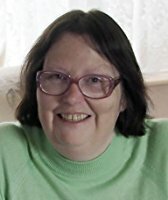 Faith Martin has been writing for over 25 years, in four genres and under four different pen names. She was born in Oxford and sets most of her crime novels within sight of the city of dreaming spires. A real nature lover and afficionado of the countryside, descriptions of wildlife and native flora often find their way into her manuscripts. Right now, JOFFE BOOKS are re-issuing the DI Hillary Greene novels in new updated editions! The first 15 books in the series are available now. Her first foray into writing 'spooky' crime, (and written under the pen name of Jessie Daniels) comes out in November 2017. THE LAVENDER LADY CASEFILE is published by Robert Hale, an imprint of Crowood Press. As Joyce Cato, she writes more classically-inspired 'proper' whodunits. So, if you like an amateur sleuth, plenty of clues and red herrings, plus a baffling murder mystery to solve, these are the books for you. I like murder mysteries. Will add this to my TBR. Good review. Sounds like a great series. I love a good mystery. Not a series I'm familiar with. I love mysteries though so I might have to check it out. Great review. New name for me - thanx! I love a good "who dunnit", fab review!